Dogs and dog owners take a celebratory stroll around McKenzie Park Saturday during the fourth annual Bark for Life. Dogs can be a cancer patient’s best friend, and some of those friends spent Saturday morning doing what they do best: hanging out with their buddies, socializing with other four-legged friends and barking up a storm. It all took place at McKenzie Park during the fourth annual Bark for Life where family and friends came together to have fun, raise money for the American Cancer Society and to celebrate the extraordinary qualities of canine caregivers. Mary Hansal, a two-time cancer survivor, talked about how pets can make a huge impact on people struggling to beat the disease. Hansal was diagnosed with breast cancer and thyroid cancer in 2000. Hansal didn’t have a dog, but her cat, Tommy, was her constant companion during her treatment and recovery. 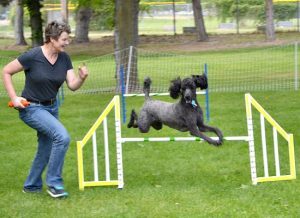 Mim Myren of Boardman and her poodle, Rango, go through the paces during Saturday’s Bark for Life. Unfortunately, Tommy, too, developed cancer and died a few years ago, but Hansal was grateful for his friendship and care he provided her during her battle with cancer. Hansal said events like Bark for Life play an important role in raising money to fight cancer. “All the dollars we’re bringing in here today is helping to get the research we need, the advocacy and the patient services,” she said. In just the past decade or so, treatment for cancer has changed dramatically – and for the better. Mastectomies are no longer the standard treatment for breast cancer. When Hansal’s sister developed breast cancer a few years ago, she underwent a lumpectomy, a far less radical treatment that removes the cancer while preserving the breast. And her sister’s dog, a black lab named Norman, was her constant companion. Canine caregivers and their friends took a celebratory lab around McKenzie Park on Saturday. The event also included dog contests, on-site vets offering pet advice for $1 a question as part of the fundraiser, and a silent auction. Bark for Life organizers expect to have fund-raising totals later in the week.